Transit-oriented development strategies can help urban areas develop sustainably, uniting land use, transport planning, and urban design to create more people-oriented cities. Pictured: Small businesses and pedestrians at a hub near Mexico City’s Metrobús bus rapid transit (BRT) system. Photo by Justin Swan/Flickr. The “People-oriented Cities” series – exclusive to TheCityFix and WRI Insights – is an exploration of how cities can grow to become more sustainable and livable through transit-oriented development (TOD). The nine-part series will address different urban design techniques and trends that reorient cities around people rather than cars. Cities across the world are racing to cope with rapid and often uncontrolled urbanization. Residents of the suburban outskirts of Mexico City, for example, spend as much as 2.5 hours commuting each way and 30 percent of their monthly income on transport. And these challenges will undoubtedly be exacerbated by the 1.5 billion people expected to move into cities by 2030. But this trend is surmountable. Shifting urban design to focus on the needs of people—not cars—can expand access to opportunities, jobs, education, and healthcare for urban residents. Transit-oriented development (TOD), a planning strategy that supports mixed-use residential and commercial areas, access to public transport, and a range of mobility options like cycling and walking, holds the key to creating sustainable, livable urban communities. To help city leaders shift to a planning paradigm that creates more compact neighborhoods and sustainable cities, EMBARQ has released a Transit-oriented Development Guide for Urban Communities. The guide combines best practices from existing communities and design guidelines for creating healthy, sustainable, people-oriented cities. The “People-oriented Cities” series will build on this guide to discuss both the merits of transit-oriented development as well as the specific policy and design components necessary to its implementation. But first, it’s important to understand what transit-oriented development is and how it can improve quality of life for all urbanites. What can transit-oriented development do for cities? Transport sits at the intersection of many factors that shape urban communities. It has the capability to unite diverse enclaves throughout the city, helping communities recognize the physical, economic, social, and environmental networks that weave them together. Connected streets create strong, resilient communities, greater cultural understanding, and stronger social ties. Connected communities expand job and economic opportunities, especially for women, as well as improve the health of city residents by improving walkability and increasing physical activity. Neighborhood centers and commercial activity at street levels that create active ground floors provide more “eyes on the street,” which keep citizens safer, and drum up more foot traffic for local businesses, in turn keeping money in the community. In this way, transit-oriented development promotes local economic development, supporting small and medium businesses and allowing small entrepreneurs to compete with large brands on a more level playing field. Transit-oriented development also decreases the need for people to travel long distances, in turn decreasing the need for private cars and costly, auto-centric infrastructure. This, of course, means lower greenhouse gas emissions, better air quality, and fewer lives lost in traffic crashes. There are several key policy and design components necessary to enable transit-oriented development. Vehicle demand management measures can limit unnecessary use of private cars within communities through restrictions and financial disincentives, while also increasing safety by prioritizing the movement of people over cars. Meanwhile, spaces that mix both commercial and residential uses, which allow residents to live closer to everyday needs, promote economic activity, community engagement, and safety. For example, locating residential developments within half a mile of rail lines fosters demand for business by providing potential customers in the form of local residents and incoming transport users, and makes sustainable transport a more convenient choice for those residents. What these elements have in common is that they put people and communities first and ahead of vehicles, streets, and other city infrastructure. People-oriented design is not limited to the built environment, but also encompasses the participatory planning processes that allow citizens – even those traditionally excluded from dialogues – to have a voice in the future of their city. Urban planning practices across the world, from Mexico to India, have created car-centric neighborhoods with large urban blocks, poor pedestrian and cycling environments, and no connection to public transport. Continuing this land use pattern as the basis for future development, compounded by a persistent increase in car ownership, will only add to current problems like traffic congestion and air pollution. Some cities and even national governments are trying to turn the tables on urban sprawl. Mexico, for example, is promoting compact urban communities, aiming to combat the country’s history of sprawl by providing financial incentives for infrastructure development in the urban core rather than the suburban periphery. 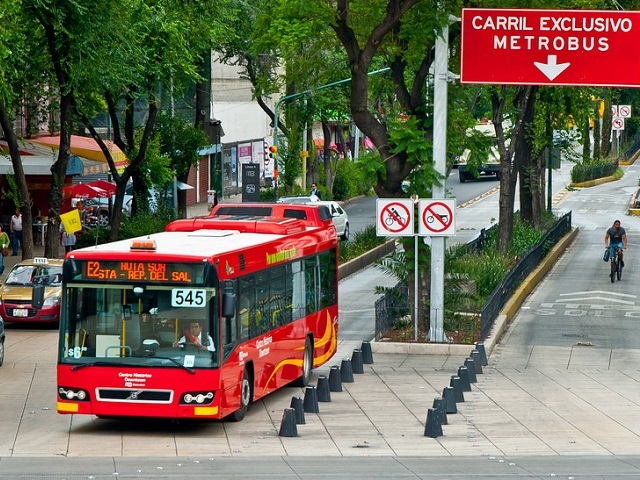 For the first time, Mexico City is preparing new urban codes based on transit-oriented development principles, promoting low- and medium-income housing near transit hubs. Set to be approved by the local government in the summer of 2014, these codes will allow developers to increase residential density, create active ground floors, and discourage car ownership by establishing a parking maximum for new buildings. But despite these examples of progress, transit-oriented development is still an under-utilized strategy in most cities. It’s time for city planners and decision-makers to embrace transit-oriented development and integrate land use planning, sustainable transport, and people-centered urban design. Large-scale adoption of TOD can tie together many currently different urban development strategies in the common goal of improving access and quality of life for city dwellers throughout the world. Stay tuned for the next entry in the “People-oriented Cities” series, which will address the role of quality public transport in effective transit-oriented development. Tejas Pande and Rachel Jaffe also contributed to this blog.